The world of the very small first opened itself to the eyes of mankind in 1595 when Zaccharias Janssen invented the first modern light microscope. This type of microscope uses light scattered by glass or plastic lenses to magnify an object up to 2000 times its normal size. However, as science advanced over the centuries, the need for a stronger microscope able to see smaller and smaller objects emerged. Enter the electron microscope. The first electron microscope was patented in 1931 by Reinhold Rundenberg of Siemens. While the first one was much less powerful, modern electron microscopes can magnify an image up to two million times its original size. To get an idea of the scale, an electron microscope is able to see individual nucleic acids, the building blocks of our DNA. An electron microscope produces its ultra fine image by passing a particle beam of electrons through electrostatic or electromagnetic lenses, similar to the principle of a light microscope. However, since the wavelength of an electron beam is so much shorter. A shorter wavelength means a higher resolution. Electron microscopes are a general category in which there are several varieties. The two most common are transmission electron microscopes and scanning electron microscopes. Both use a beam of electrons to view the very small, but the beam acts in different ways. 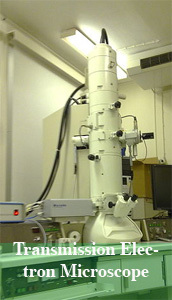 A transmission electron microscope uses a high-powered beam to essentially shoot electrons through the object. The electron beam first passes through a condenser lens in order to concentrate the beam on the object. Then the beam goes through the object. Some of the electrons pass all the way through; others hit molecules in the object and scatter. The modified beam then passes through an objective lens, a projector lens and onto a fluorescent screen where the final image is observed. Because the electron beam passes entirely through the object, the pattern of scatter gives the observed a comprehensive view of the interior of the object. A scanning electron microscope doesn’t use a concentrated electron beam to penetrate the object, as a transmission electron microscope does. Instead it scans a beam across the object. During the scanning the beam loses energy in different amounts according to the surface it is on. A scanning electron microscope measures the lost energy to create a three-dimensional picture of the surface of an object. While not quite as powerful as a transmission electron microscope, a scanning electron microscope is able to produce comprehensive magnified images of much larger objects, like that of an ant. Recently, other electron microscopes have been developed that combine transmission and scanning technologies. However, all electron microscopes, transmission, scanning or otherwise employ the basic principle of magnifying an object through the use of an electron beam. 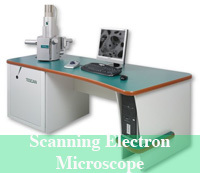 Find more information on Electron Microscopes. Manisha Kumar. "Difference Between Scanning Electron Microscope and Transmission Electron Microscope." DifferenceBetween.net. August 24, 2009 < http://www.differencebetween.net/science/difference-between-scanning-electron-microscope-and-transmission-electron-microscope/ >.